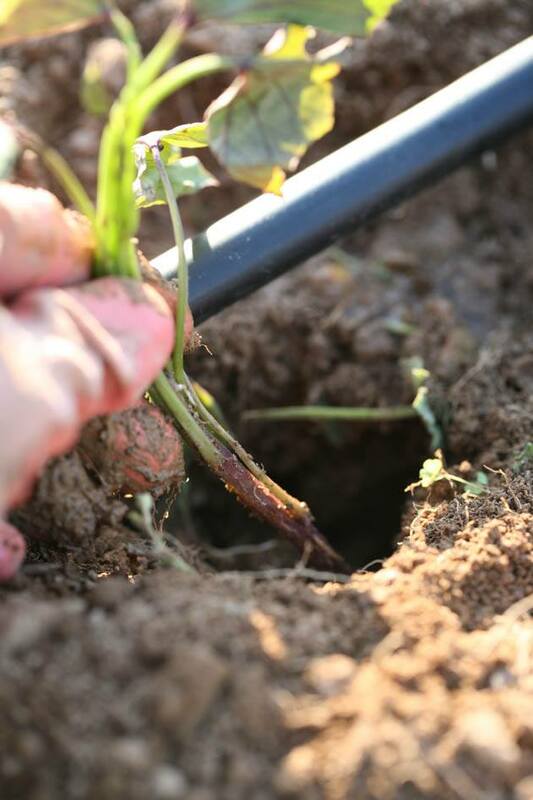 In this post, we will learn how to plant sweet potatoes. 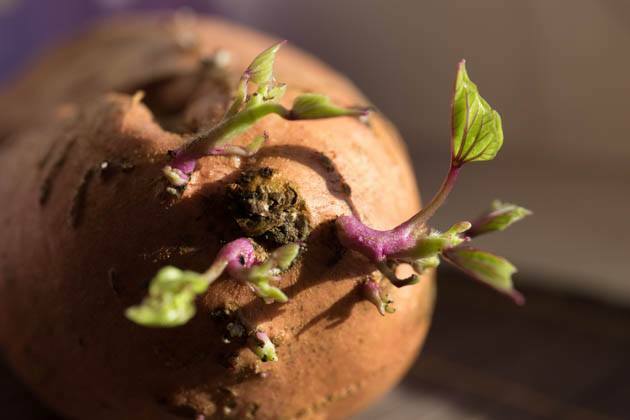 We are going to go over how you can grow potato slips on your own, where to purchase them if you decide not to grow them, and how to plant them in the garden correctly to ensure the best harvest. There is something about growing potatoes. They are so filling, so tasty, and keep so well for a long time even if you don’t have a root cellar. To me, growing potatoes, Irish or sweet, always feel like a very productive thing to do. I wish I could say that growing Irish potatoes is fun. It might be fun for you if you live in a colder climate, but here in the South, growing potatoes is a bloody battle start to finish. The Colorado beetles are vicious! You can see what they did to my potatoes a couple of years ago here. But sweet potatoes are different. They are very easy to grow here in the South. It’s easy to handle the slips, easy to plant them, they spread and cover the ground so there is not much weeding to do, you can eat the leaves (we’ll talk about this soon), and you get to dig in the dirt to find your precious harvest which I find is always fun (especially for the kids). We also don’t have many pests here in the South that bother sweet potatoes. I think the biggest problem for us here are the bunnies. There are a lot of wild ones and they love the sweet potato leaves. I had one year that deer came to visit too and ate a lot of my plants. But honestly, I prefer dealing with them than with the nasty bugs. Sweet potato are not closely related to the Irish potato botanically. The sweet potato is a plant that belongs to the Morning Glory family. You can see this clearly by the beautiful flowers it produces later in the season. 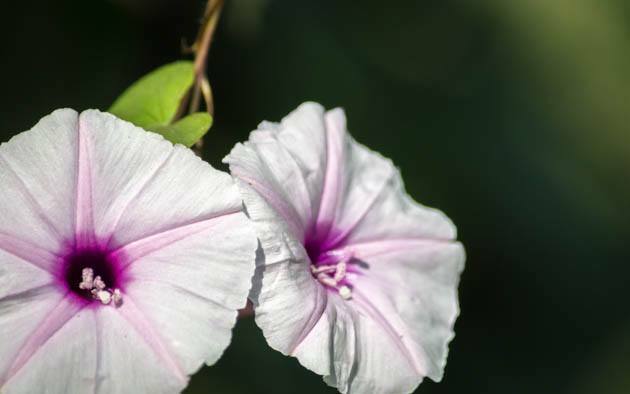 The sweet potato vine is actually a perennial, meaning, if you leave it in the ground it will die in the frost but most likely will come back next spring. However, farmers and gardeners all over grow it as an annual since we grow it for the edible sweet tubers. 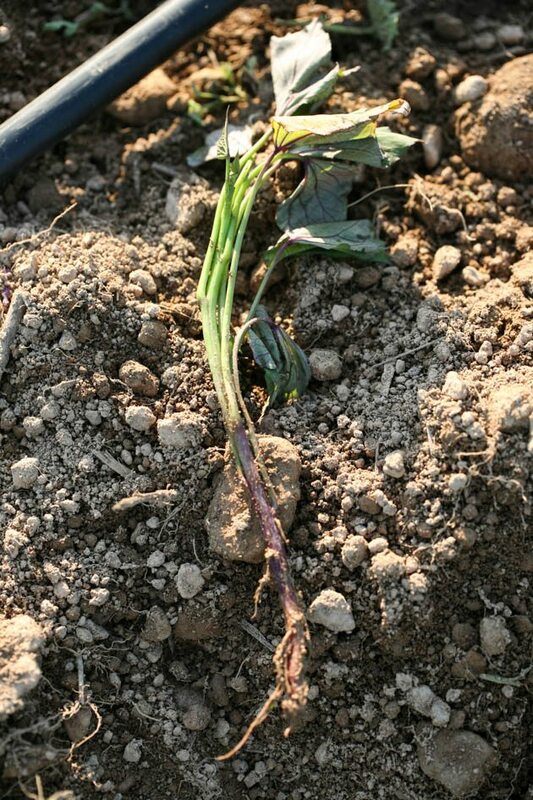 Once you remove the sweet potato from the ground, you have to replant slips next year to produce more sweet potatoes. 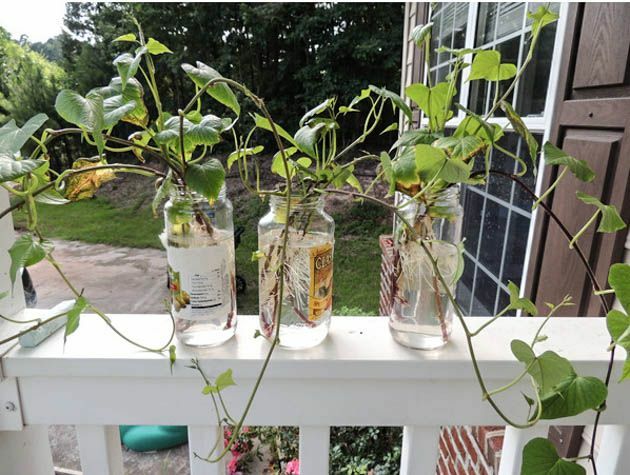 But just know that you can, if you wish, grow the vine as an ornamental plant (it’s a great ground cover) for its beautiful flowers and you can harvest its young leaves and use them as salad greens. The leaves contain high amounts of antioxidants, they can assist in reducing inflammation, they support the digestive system because they are high in fiber, they are said to assist the body in maintaining healthy blood sugar levels, and they are healthy for our hearts. Even though the leaves and flowers are great, most of us are after the potatoes themselves. They can range in colors from orange to yellow to pink or purple (I planted purple potatoes a few years ago. They were a lot of fun to grow and beautiful but I found that they weren’t as sweet as the orange ones. You can read about this experience here). They are full of carbohydrates, dietary fiber, beta-carotene, and vitamins B and C. They store well over the winter and can be cooked in a million different ways. How or Where to get Sweet Potato Slips? We grow sweet potatoes from sprouts called slips. You can grow slips yourself or you can order slips from most seed companies (I order mine from Johnny’s Selected Seeds). If you want to try and grow slips yourself what you are basically going to do is sprout the sweet potato. Depending on the size of your growing space you might just want to sprout one potato or a few of them. Each potato will give you a few slips, around four or so, and each slip will become a sweet potato plant that will produce a few tubers. There are a few ways to do this but whatever way you choose make sure to always start with an organic sweet potato since the ones you find in the grocery store are usually treated with chemicals that prevent them from sprouting or that slow the sprouting process drastically. You also want to make sure that you start this process at least a couple of months before outdoor planting time. 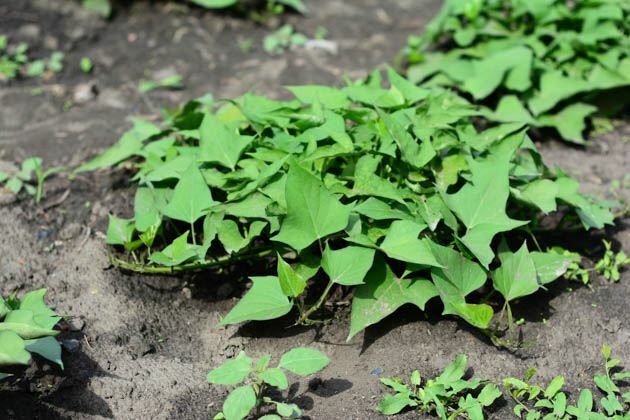 You can use Google to find out what is the best time for planting sweet potatoes in your area or you can ask at your local cooperative extension. Generally, sweet potatoes need a long and hot growing season, at least four months. Here in the South (zone 7b) I plant them in the middle of May and harvest in the middle of October. 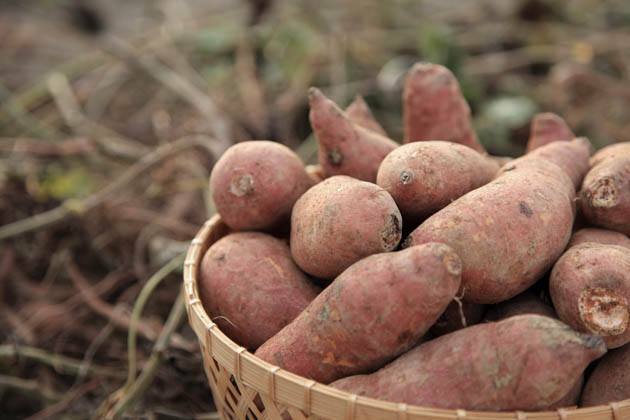 If you live in cooler climates you might still be able to grow sweet potatoes with a little extra attention. For example, you can use black plastic mulch to warm the soil quickly (you want to cover the soil about three weeks before planting) or you can cover the plants with agriculture fabric to keep the heat around them a little longer at the end of the season. Option 1 – your first option is to cut your potato in half and place the flat side down in a dish that you filled with a little bit of water. This way the tip of the potato is pointing up and the potato will sprout from there. Option 2 – fill a jar with water. Stick a few toothpicks around the middle of the potato and use them to hold the potato on the rim of the jar so its bottom half is in the water but not touching the bottom of the jar and its upper part is above the jar (you can see how I did this here). The potato will sprout from the top. Try to check your potato to see if you can spot “eyes” on one of its ends and keep that end out of the water. I once had a potato that just didn’t sprout, I ended up flipping it after a couple of weeks in the water and a week later it sprouted. Option 3 – take a shallow container (maybe 10 inches tall or so) fill it with potting soil and bury a few potatoes in there. Make sure the soil stays moist. The sprouts should start popping out from the soil within a couple of weeks. I once had a conversation with a local sweet potato farmer and he said that this is how they do this. They plant a few hoop houses with sweet potatoes really close together around February, cover them with a little bit of soil and let the potatoes sprout. Then they cut all the slips and plant them in rows in the field the middle of May. For all those options, make sure you place your container and potatoes in a warm place. Sweet potatoes love heat so the warmest place in your house will do best or if you have a greenhouse that keeps warm early in the season that’s a good option too. Also, don’t forget that once the potatoes sprout the leaves are going to need light to grow so you either need to set up grow lights or place them close to a well-lit window. Once the potato sprouts, the slips grow pretty quickly. When they are 8” long (or so), you can cut them at the base and separate them from the potato. Now, if the time is right you, can go ahead and plant them in the garden right away, they will grow their roots right there and take off. If it’s a bit early in the season, you can keep them in a jar of water by the window or under the lights until it’s time to plant outside. 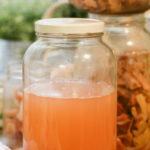 In the jar, the slips will keep growing and will grow roots too. This is fine, once it’s time to plant outside you just stick the whole thing in the ground, roots and all. 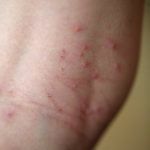 If you want to skip the whole slip growing ordeal you can order slips online or maybe find them at a local farm supply store. I order mine from Johnny’s Selected Seeds. I order a variety called Beauregard, they are orange and super sweet and keep very well. I place my order early in the spring when I buy the rest of my seeds but they send them in a separate box according to your growing zone later in the spring. It’s better if you’re ready to plant them right when you get them. 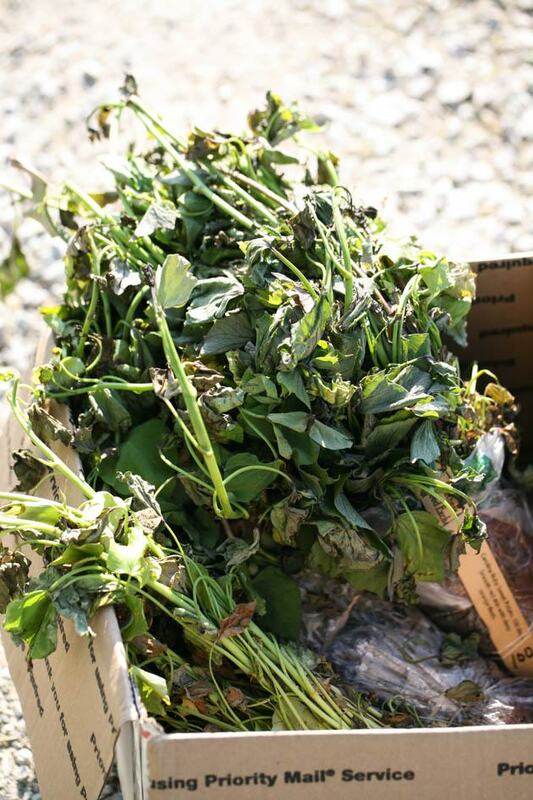 They look all wilted and half dead but do not worry, it’s very hard to kill these guys! You can see that my slips from Johnny’s didn’t have many roots on them, they were probably just cut off the potatoes a few days before shipping, but this is just fine, there is no need to place them in water if you can plant them right away. So your slips are almost ready, it’s warm outside and it’s time to prepare the bed for the potatoes. In order for the potatoes to form easily, you want to make sure your soil is well-drained, light, and fluffy at least ten inches down. Sometimes it’s easier to build a little raised row (see in the picture below) than to dig down. But you can always use a broad fork to loosen the soil or you can use a tiller to till it. We want a pH of about 6 but sweet potatoes can deal with soil that is a little more acidic (slightly lower pH). Make sure to add compost but keep in mind that sweet potatoes don’t like soil that is too rich. Cow manure is great, horse manure is good too but I would stay away from chicken manure unless it’s really aged well since it has a lot of nitrogen in it. If your soil has too much nitrogen in it the vines will grow beautifully all over the place but the tubers won’t form underground. Again, make sure your bed is in full sun, remember that sweet potatoes love the heat so no shade for these plants, the more light and heat the better. 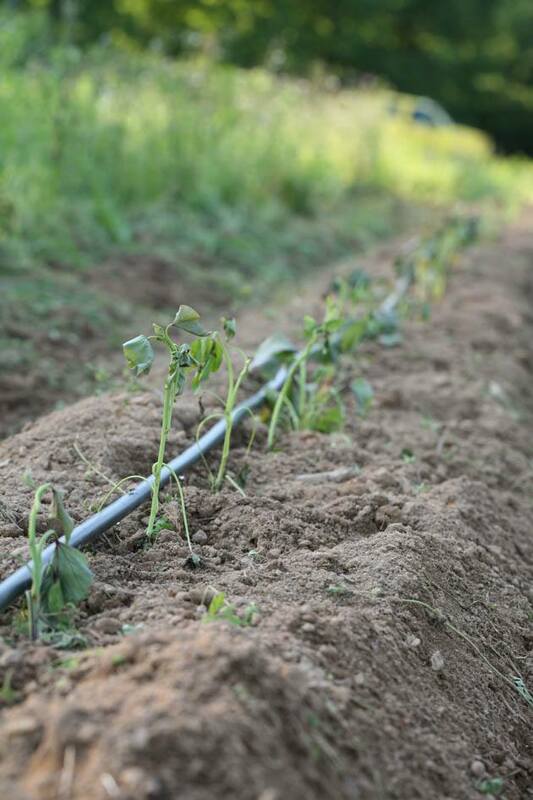 If you use drip irrigation or if you are going to use plastic mulch or another kind of mulch like straw or dry leaves or wood chips, this is the time to lay those on the bed. Dig a hole in the ground that is about six inches deep and stick tour slip right in there. Fill the hole and tack the slip in. That’s it! 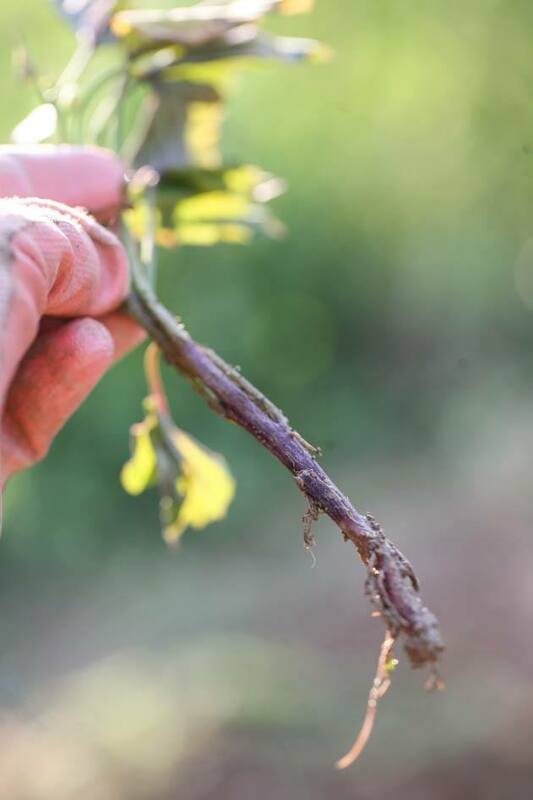 We plant the slips 12″ from each other and if you plant more than one row you want to allow about 3′ between rows so the vines have enough room to spread. It was easy to space them in the bed you see above because the irrigation line had the drip holes spaced 12” apart so I just planted by each drip hole. Like with every transplanting, make sure you do this in the afternoon when the sun is on its way down and it’s not too hot or the best case scenario is transplanting on an overcast day. Mulch will really help the new transplants at the beginning so if you can spread it around the plants that’s great. Also, remember to water well after transplanting and in the next couple of weeks while the roots are forming but are still small and need some help to reach water. Once the vines take hold they will spread and cover the bed. At the beginning you might need to do some weeding but once the bed is covered very little weeding is required. Remember that you can clip young leaves and use them as you would use spinach. They are very tasty. Later in the season, the plants start to flower and right after the flowering stage they will start to yellow a bit. This will be the time to dig in and harvest. We will go over harvesting and storing in a different post. I hope this was helpful! 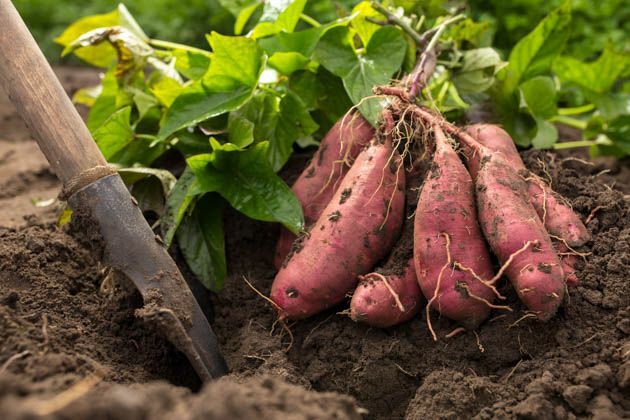 Remember that you can grow sweet potatoes anywhere as long as you can provide them with at least four months of warm, frost-free weather. It doesn’t have to be a huge garden bed, it can be a deep container and I dare say even a large pot although I’ve never tried but I can’t see why they won’t grow that way. I’d be happy to hear all about your experience with sweet potatoes! What variety are you growing? What is your set up? Do you have any pests bothering your potatoes? 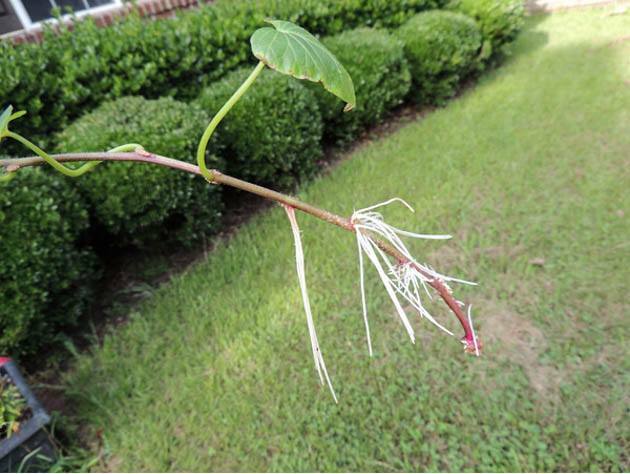 Where are you located and do you need to use any special season extension methods to grow sweet potatoes? If you have a moment, comment below! Please help! Last year we purchased purple organic sweet potatoes from (maybe?) Whole Foods. We started them inside and later planted the slips with no problems. They grew, were harvested and looked great…until we cut them and found many tiny white worms or other type insect in every one of the potatoes. These were really very small intruders and I have not been able to discover what they were and how to avoid them this year. Any ideas? I would be grateful for any help you could give us. I think that you are dealing with wireworms. There are pesticides that can kill them, but if you want to stay organic I would turn the top 8 inches of the soil and then let the chickens live in the garden for a few weeks. They’ll eat the worms and then when the other eggs hatch they’ll eat those worms too. 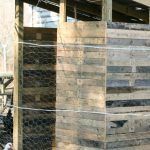 If you don’t have chickens, still turn your soil and then maybe spread diatomaceous earth A few times (don’t forget that the eggs keep hatching so any treatment has to last a few weeks until they all hatch). And don’t plant any root crop in that same location for the next couple of seasons. I grow sweet potatoes every year. I grow mine in grow bags. You can buy the grow bags on amazon. My bags are big around 35 gallon and I also use 55 gallon barrels cut in half with plenty of holes drilled in them. I use potting soil with lots of vermiculite and compost. I plant 5 or 6 plants in each container and come harvest time, I flip the container over gather all the sweet potatoes. Easiest crop I grow. That is great! I saw those grow bags before but never tried them. When I lived in town I grew purple sweet potatoes this way but in those plastic bins you can buy at Walmart. It was a great way but the bins didn’t last more than one season, they just fell apart. The grow bags are a great idea. Can you reuse them? Or do you buy new ones every year?